The day after my in-laws helped me moved in was my birthday. Wheee! We were still moving in so we didn’t do anything super fancy. The breakfast restaurant was Italian themed and is rapidly becoming our favorite restaurant in Davis. It’s called Cafe Italia if anyone is interested in going. After breakfast we unpacked more stuff. My one birthday event was going to a movie that I got to pick. I chose Kingsman (as if the title of this post and the picture weren’t enough clues for you to figure that out already). The movie was pretty awesome, filled with action scenes and callouts to other spy movies. The plot follows Eggsy, the son of a man killed while working for the mysterious Kingsman. The Kingsman are a secret spy organization working independently of other intelligence agencies to keep the world safe from evil people. They’re a small group and everyone is named after people from the King Arthur stories. The leader is King Arthur, the person filling Q’s role from the Bond films is named Merlin, Eggsy’s mentor is named Galahad, etc. I love the King Arthur stuff and it’s coupled with the agents being chivalrous and knightly in their mannerisms. Eggsy’s initial selection is a lot of fun. Bar fights, car chases, evil step-fathers. Awesome stuff! Some of it you’ve already seen in the trailer if you watched the trailer. Go watch the trailer! After he joins the training program the movie slows down a bit. 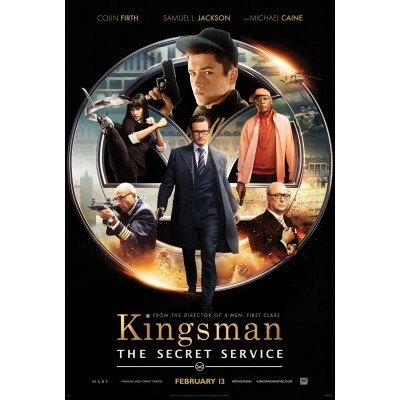 Eggsy’s mentor, played by Colin Firth, investigates the villain’s plan to kill half the Earth’s population, while Eggsy goes through a series of unusual training exercises. The concept of the training exercises is fun. One of them is six people sky diving and after they’ve jumped Merlin informs them that only one of them has a parachute. Unfortunately, the training sequences just aren’t as fun as the car chases and bar fights in the first half hour. The movie heats up when Eggsy finally takes on the villain with help from the other Kingsman. I don’t want to give too much away from that part of the movie though. I’d definitely recommend it. It’s a solid action movie and my wife said it was even a little bit thought provoking. And it’s just barely still in theaters as I’ve been dragging my feet about making blog posts. Quick! Go see it!